The workshop filled with flying sawdust as Joe Solotes carefully held the rough hewn lacrosse stick against the sander. He turned the wood, working intently. He said he only has one goal. Once he finishes creating the wooden game stick, he never wants to see it again. “I’m putting my word in my stick. This one is good. This one will not come back here,” he said. That’s the difference between his sticks and all the synthetic sticks being used in today’s lacrosse games. 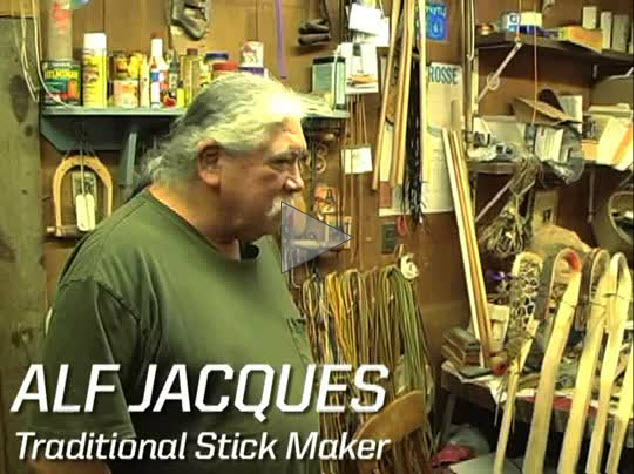 Solotes is the lone lacrosse stick maker at Tuskewe Krafts on the Tuscarora Indian Reservation. Over the past 10 years, he has created as many as 10,000 sticks a year, making the Niagara region company the largest manufacturer of wooden lacrosse sticks in North America. How Solotes, who is not an American Indian, came to be one of the few craftsmen undertaking the native craft in North America has the undertones of a fireside tale. Solotes, of Italian descent, moved to the reservation at age 8 when his mother married his Tuscaroran stepfather. One day about 10 years ago, his neighbor asked him to come and work at Tuskewe Crafts for a day. Back then, the company was owned by John Wesley Patterson, who began making the lacrosse sticks about 38 years ago. They stationed him at the steamer that day, where square shafts were softened so they could be bent. And so, Solotes came back the next day. And the next. Patterson has since died and Solotes, who remembers him fondly, said Patterson taught him everything he knows about making wooden lacrosse sticks. Solotes loves the work. “I would love to do this the rest of my life,” he said. But he likens the wooden lacrosse stick to a wooden bat. “The wooden stick is becoming obsolete as far as the modern day lacrosse player is concerned,” he said, noting that players seem to favor the lighter sticks on the market made of graphite or titanium. That’s could be unfortunate, he said, because the weight of a wooden stick makes a great training tool. “I recommend to players just starting out to start with a wooden stick. Then when you switch over to a plastic stick, it’s going to feel like you’re not carrying anything at all,” he said. There are some players who prefer a wooden stick, however, including some box lacrosse players in Canada, who largely like wood because they play a more physical game and his sticks are made from hickory, one of the hardest woods available. That’s actually the problem that threatens the little company, as shagbark hickory is very hard to find and unless the wood is picked at the exact right time — while in bloom and running sap — the wood cracks and breaks. Owner Elizabeth Printup, who is also a nurse practitioner at the health center on the reservation, said it’s very hard to find the right wood. Printup, who was Patterson’s niece, bought the business with her husband, William, after Patterson died. Both had spent some time working at Tuskewe — Elizabeth weaving stick nets and William helping to make sticks. Today, while working full time at their other jobs, they struggle to keep the little business running because “It is a part of the culture,” she said, and she is seeking a grant to operate the facility as an educational center. Regardless, as wooden stickmakers, they are still the largest producer on the continent. Printup said they are grateful to Solotes for that. “It’s truly an art. Not everyone can do it,” she said. When the hickory planks come to the barn that houses the workshop, Solotes trims them to varying sizes and, once the sticks are softened in the steamer, bends the tips of the sticks around a metal jig. After shaping, the sticks dry for six to eight months. Beside stickmaking, Solotes talks with tourists who have come from as far away as China and Australia to see how sticks are made. He is always ready to teach the craft, but not too many are eager to learn. In the meantime, Solotes will be the keeper of the craft on the reservation. “This is my way of life now,” he said. Although his mother passed away in 2004, Solotes maintains close roots to the reservation. He lives next door to his stepfather and the two men have a close relationship, and his girlfriend, Gaenhyenhawi Greene, is an Onondaga Indian and grew up on the reservation as well. Solotes takes a decidedly native tone when he speaks of his creations, echoing the storied reverence of American Indians for the natural world and its offerings.